The Fayette County Township Association’s annual winter meeting was held Jan. 10. The outgoing president, Fayette County Commissioner Jim Garland (second from right), was honored for his service, and the incoming president, Marion Township Trustee Cody Kirkpatrick (second from left), was welcomed. Also pictured are (far left) Ted Waddle, Concord Township Trustee, and (far right) Keith Montgomery, Concord Township Trustee. 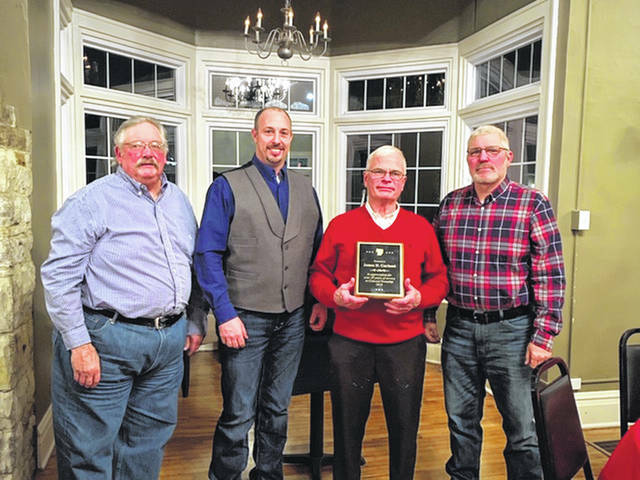 The Fayette County Township Association recently held its annual winter dinner meeting at the Highland House in Washington C.H. Jim Garland, the outgoing president and now Fayette County Commissioner, passed the gavel to incoming president Cody Kirkpatrick. Garland was recognized and presented with a plaque for his outstanding 29 years of service as a Concord Township Trustee. He was elected as the newest county commissioner in the fall of 2018, and began his term in January. Also at the meeting, county commissioner Dan Dean and Fayette County Sheriff Vernon Stanforth spoke about the need for a new county jail. Fayette County Engineer Steve Luebbe discussed the county’s mega-site near the US 35/Interstate 71 intersection, and road work that will need to be completed. Glenn Rankin of Jasper Township requested help from other townships in an effort to research and bring forth historical information on each township in conjunction with the Fayette County Museum. https://www.recordherald.com/wp-content/uploads/sites/27/2019/01/web1_IMG_2260.jpgThe Fayette County Township Association’s annual winter meeting was held Jan. 10. The outgoing president, Fayette County Commissioner Jim Garland (second from right), was honored for his service, and the incoming president, Marion Township Trustee Cody Kirkpatrick (second from left), was welcomed. Also pictured are (far left) Ted Waddle, Concord Township Trustee, and (far right) Keith Montgomery, Concord Township Trustee.